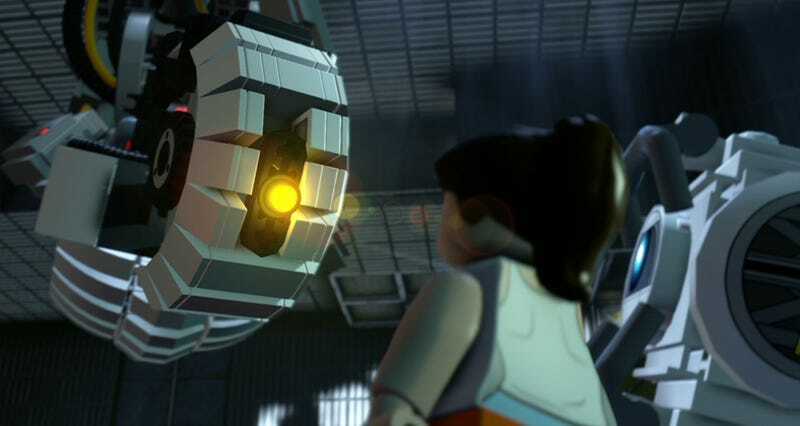 Valve’s homicidal disk operating system doesn’t do “cameo” or “guest star.” The moment GLaDOS arrives in LEGO Dimensions it’s her game, from her face-off with one of science fiction’s greatest villains to the bittersweet ending. I feel like I just finished a new Portal game. Warning: We’ll be spoiling the hell out of the Portal moments in the game further down in the article. I’ll warn you again once we get there. I am not a monster. Our full, spoiler-free review of LEGO Dimensions will run tomorrow. LEGO Dimensions is Warner Bros. and developer TT Games’ entry into the toys-to-life category. Like Skylanders or Disney Infinity the game sees players placing figures on a plastic base connected to their game console, bringing them to playable life. Unlike the other two games however, LEGO Dimensions features actual articulated LEGO minifigures, with accessories and vehicles that must be assembled before play. It’s a massive game that brings together characters from a wide variety of LEGO-fied entertainment properties—Scooby Doo, DC Comics, Doctor Who, Back to the Future, The Wizard of Oz, The Lord of the Rings, Ghostbusters, The Simpsons and more. Yet in such prestigious company, it’s the evil science computer from Valve Software’s first-person puzzler series that shines the brightest. Non-spoilers first, here comes a little common knowledge. There are three ways to visit the hallowed halls of Aperture Science in LEGO Dimensions. Two involve spending $30 or so on the Portal Level Pack in addition to $100 for the base game. The pack gives players access to the Portal 2 adventure level, a relatively short (30 minutes or so) reunion between the series’ mute protagonist and her chatty frenemies—GLaDOS, voiced once more by the amazing Ellen McLain, and Stephen Merchant’s Wheatley. Along the way Chell we be prompted with in-game instructions to construct her old friends Companion Cube and Sentry Turret, both of which can be rebuilt twice over into different configurations. The adventure level is the closest LEGO Dimensions comes to a pure Portal experience. moving from test chamber to test chamber, verbally abused by GLaDOS all the while. Owning the Chell minifigure also gives players access to the Portal adventure world, a free-roaming level packed with challenges to complete and secrets to find. They can also spend LEGO bits to build iconic locations from the series. There’s a fair bit to do across this sprawling location—I’ve spent an hour wandering about and haven’t seen everything there is to see. Here’s a couple of clips from the adventure world. It’s got some spoilers in it. Between the adventure level and adventure world there’s a ton of additional Portal content to explore in LEGO Dimensions, but where GLaDOS really shines is in the game’s main story. The spoilers are coming. The following paragraphs will reveal things about LEGO Dimension’s Portal story content that anyone purchasing the game for Portal reasons may want to experience for themselves. Suffice it to say that if you were one of the people who saw the first LEGO Dimensions Portal trailer and said “Damn, I might have to play that now,” you were right. You have to play this now. And it just gets more absurd from there, really. GLaDOS tries to lead the heroic trio through a series of tests, but they insist on cheating using their special LEGO Dimensions powers. Mind the sloppy playing, it’s my first time. The testing ultimately leads to a showdown—Batman, Gandalf and Wildstyle versus GLaDOS. Deadly neurotoxin comes into play, because it pretty much has to. Frustrated by the repeated triumph of the heroes, GLaDOS decides to stop playing and simply let nature runs its course. The trio has a plan, but they’ll need a distraction. I mentioned spoilers. Remember I mentioned them. Here comes a big one. Cue the biggest meeting of damaged artificial minds in the history of science fiction. For those of you too young to remember, that’s HAL 9000. Look it up. GLaDOS’ defeat isn’t the end of the line for our favorite killer computer. She appears in several places as the game progresses. In Middle-Earth she summons orcs and goblins wearing computer core helmets, for example. She’s a thorn in our side, but not for long. Before the ultimate battle with Lord Generic Evil Name our heroes return to Aperture Science to recruit GLaDOS aid. They do this by removing her defective morality core, leaving her slightly friendlier (but still just as insulting—it changes her actions, not her thoughts). GLaDOS proves an invaluable asset, both in terms of aiding the heroes directly and wrapping up the game’s adventure mode in a tidy little bow. Here’s the game’s end credits. It doesn’t get much more spoilery than this. Like I said, GLaDOS doesn’t “guest star.” By the end of LEGO Dimensions, she’s made it into a Portal game, complete with a new song written by Jonathan Coulton and performed by Ellen McLain. As with every Portal game ending, I was in tears by the time the song finished. Happy tears. And so a game based on purchasing and collecting tiny toys is completely taken over by one of the few characters that doesn’t have an expensive toy counterpart. Tune in tomorrow for our full LEGO Dimensions review. And stop calling me Dave.